The opening of yet another retail bank branch office is more likely to evoke ennui than political discontent. 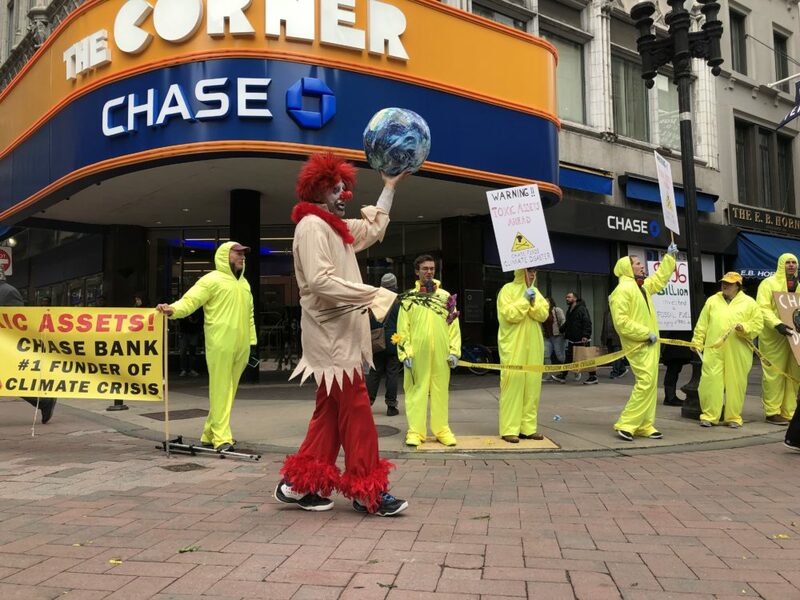 But protesters in hazmat suits lined up Wednesday outside the entrance of the new Chase Bank in Boston's Downtown Crossing. 350 Massachusetts, a local grassroots climate activist group, organized the Boston event as part of a nationwide action targeting major U.S. investment banks. Carrying signs that read “#1 FUNDER OF CLIMATE DISASTER” and “TOXIC ASSETS,” the protest called out JPMorgan Chase’s leading role in the financing of large fossil fuel projects around the world — a role that belies Chase’s aggressive public relations effort to present itself as an environmental leader. [JPMorgan Chase] funds more oil and gas exploration in the fragile Arctic than any other investor. But Dimon’s pro-Paris stance is hard to reconcile with Chase’s investment record since the agreement's adoption in 2015. According to the 2019 Fossil Fuel Finance Report Card, issued by a consortium of environmental groups, JPMorgan Chase doled out $196 billion for fossil fuel projects between 2016 and 2018. Chase was far out ahead of the pack — the number two fossil fuel investor, Wells Fargo, invested $40 billion less. What makes the JPMorgan Chase’s record so egregious is not just the magnitude of its fossil fuel portfolio, but the types of projects it has bankrolled. According to the report card, the bank funds more oil and gas exploration in the fragile Arctic than any other. It’s the top banker for ultra-deepwater oil and gas development. And it’s also first in coal mining and liquefied natural gas. Most damning is Chase’s track record on tar sands development, yet another category in which it was the top U.S. bank. The industrial process to extract bitumen, a viscous low-grade crude, makes tar sands oil a particularly greenhouse-gas-intensive fuel. Its production requires tremendous quantities of fresh water that ends up in toxic tailings ponds. Tar sands projects in Canada and elsewhere have devastated vast tracts of boreal forests that were natural carbon sinks and habitat for threatened wildlife. The big banks control the capital that determines the course of our carbon economy. So, while JPMorgan Chase can legitimately claim that it promotes renewable energy, those benefits are negated by its massive investments in the dirtiest projects of the fossil fuel industry. Chase is not alone in this regard — all the big banks have fossil fuel exposure. But a few banks in Europe are at least trying to raise the bar on climate consciousness. One example is the French giant, BNP Paribas. In 2017, the bank adopted policies to drastically constrain its investments in extreme fossil fuels like tar sands, coal and Arctic oil and gas. It also now refuses to finance pipeline projects for fracked natural gas or the construction of terminals supporting the export of liquefied fracked gas. BNP Paribas still has considerable fossil fuel investments, but its policies are headed in the right direction. If other big banks followed its lead, the impact would be significant. Unfortunately, shareholders haven't convinced major investment banks in the U.S. to reduce the carbon footprint of the projects they fund. In March, lawyers for Goldman Sachs and Wells Fargo successfully petitioned the federal Securities and Exchange Commission to disallow proxy resolutions brought by activist shareholders that would have required the banks to consider the climate impact of their loan portfolios. The protesters at the new Chase branch in Boston were asking customers to cut up their Chase credit cards, switch their accounts to other banks and to let Jamie Dimon know why. They have a point. We make personal sacrifices to reduce our own carbon footprints. We ask energy producers to be responsible for their products. We demand that our elected officials take action. Wall Street shouldn’t get a free pass. The big banks control the capital that determines the course of our carbon economy. It’s not enough that they advance clean energy technologies. 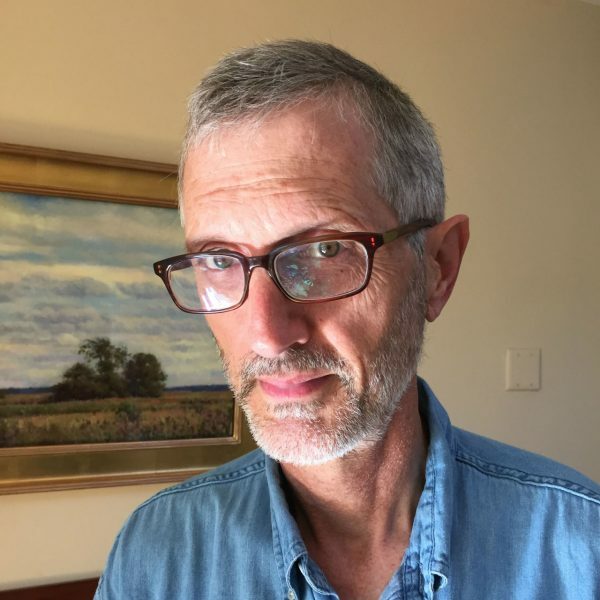 They must acknowledge the harm their business investments may cause and — regardless of profits they may forego — refuse to underwrite environmental ruin. NPR: How'd You Feel If Your Boss Made $486 For Every Dollar You Make? Also by Frederick Hewett: What Happens To The Charles River If 100-Year Storms Are The New Normal?